Jim Gaffigan performs at Mayne Stage in Rogers Park for Georgetown Scholarship Program on Thursday, Sept. 20. The generous support given tonight will help provide students access to resources and a community focused on their success. We are thankful to everyone in attendance, particularly Jim Gaffigan who brought us together for a great cause and a night of comedy. The Standup for Georgetown charity event featuring comedian Jim Gaffigan raised $24,000 for the Georgetown Scholarship Program on Thursday, Sept. 20. 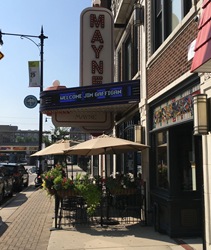 The Georgetown alum took time during his “Fixer Upper Comedy Tour” to support the event held at Mayne Stage, a historic theatre in Rogers Park. The successful event produced by Michigan Avenue Magazine and presented by Wintrust Financial and Celebrity Cruises included a meet and greet with the Grammy-nominated comedian. All proceeds benefited the Georgetown Scholarship Program, which helps to empower hard-working, low-income, often first-generation students at the university.